Standing before several hundred people at City Hall Plaza yesterday, genocide survivors representing five countries, where more than 12 million people were killed, ignited a large torch to signify their hope for bringing an end to the suffering and death in Darfur. They called upon China, host of the 2008 Summer Olympics, to use its influence with the Sudanese government and its permanent seat on the UN Security Council to address the crisis. "The Sudanese government is not that strong on its own," said 21-year-old Carine Gakuba, a member of the Tutsi ethnic group, who said she lost her four siblings and parents as a result of genocide by Hutus in Rwanda in 1994. The theme of next year's Olympic games in Beijing is "One World, One Dream," and organizers and speakers emphasized that they want people in Darfur to realize that vision. "The Olympics is a call to our better natures," said US Representative John F. Tierney, a Salem Democrat. "If anybody has leverage in Sudan, it is China, and we must ask them to stand up and speak out." Organizers said China takes a hands-off approach to humanitarian efforts but through its economic interest has upheld the Sudanese government's maltreatment of the Darfur region, located in the western part of the country. China buys about two-thirds of Sudan's oil and has invested $7 billion in oil projects and infrastructure. Jill Savitt, director of New York-based Dream for Darfur, said that on a recent trip to Africa she visited refugee camps in an area where women had been raped, infants killed, villages destroyed, and people lived in squalid conditions. She said that China did not abstain from a UN resolution to bring troops into Darfur, marking "a new milestone of progress." "But it's not nearly enough because nothing has changed on the ground," Savitt said. 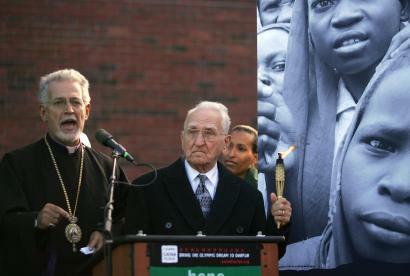 Boston yesterday became the third US city to hold the Dream for Darfur Olympic Torch Event. Similar events have been held in countries that have experienced genocidal violence, including Rwanda, Armenia, Germany, Bosnia, Cambodia, and the border of Chad and Sudan, Savitt said. Speakers competed to be heard with a group of about a dozen people gathered nearby chanting, "Liars" and, "Stop the racist lies." Members of groups including Boston Anti-Zionist Action and the Troops Out Now Coalition, held signs that read, "Free Palestine" and "Stop Attacking Sudan." They said that if the United States intervenes it would steal Sudan's resources.